What are the best backup cameras for RV GPS systems? If you don’t have the time to look up information online about the best RV GPS backup cameras, this short paragraph will be your best bet for finding the navigation system you need. By reading about various models mentioned by user feedback, expert websites, and about their reliability tests, we came to the conclusion that the Rear VIew Safety RVS-770613 is the product you should consider if you want nothing but the best. Sturdily built, the backup camera is capable of going through extreme weather conditions without suffering any damage; it serves to know that the casing is waterproof and that all the wiring is made of premium grade materials. The 130 degree viewing angle makes sure that you will not have to deal with any blind spots, so you will be able to park safely, even under less than ideal conditions. The system allows you to connect more cameras, so you can have improved field of vision, and, if you want, you can even hook up a DVD player. If the Rear VIew Safety RVS-770613 is temporarily unavailable, you can safely go for the Atian Wireless IR as it came in a close second in our search for the best RV GPS backup cameras. Choosing the best backup camera system can be confusing so we have included the following tips in this brief buying guide. Once you know what you need, you will find it easier to choose the right backup camera for your large recreational vehicle. One of the most important aspects to consider is the construction of the camera housing. This is what protects the camera from the weather and any debris that might get flung up off the road. The best RV backup camera will be water and weatherproof, and also have a high IP rating. The higher the IP code the better the degree of protection, and you want to choose a rearview camera with at least an IP66 rating. Backup cameras that come with sealed cable connectors and wires that are designed to be installed facing up are also better able at preventing water from getting inside. If you are trying to backup or park a large vehicle safely and easily you need a rearview camera that is capable of giving you a wide viewing angle. This means that you will have to pay close attention to the size of the sensor, and the length of the lens focal point. Backup cameras with ⅓” sensors are generally able to provide you with the wide viewing angle you need to safely steer your RV. You might also want to consider choosing a model that lets you adjust the viewing angle 30 to 180 degrees, so you can keep blind spots to a minimum. If image quality is also a concern, you probably want a rearview camera with a CCD sensor. You want to choose a backup camera that comes with a 5” or 7” monitor so you can easily see the images being displayed. Controls placed in front allow you to easily navigate the menu, and full color displays are always an advantage. Now that you know what you should be looking for in your next backup camera, here are three models that you should definitely consider. They are some of the best on the market and should be able to provide you with all the visibility you need for parking even the largest RV. With an IP rating of 68 this backup camera can withstand almost any weather or road condition. The sturdy casing is weather and waterproof, and the cable connections are constructed with aircraft grade materials. There are 18 infrared lights so you can easily reverse and park in the dark, and with the 7 inch color monitor all of the images appear sharp and clear. The 2.1mm lens allows you to see 130 degrees, and effectively eliminates potentially dangerous blind spots. You will also appreciate the helpful grid lines which can adjusted as needed. 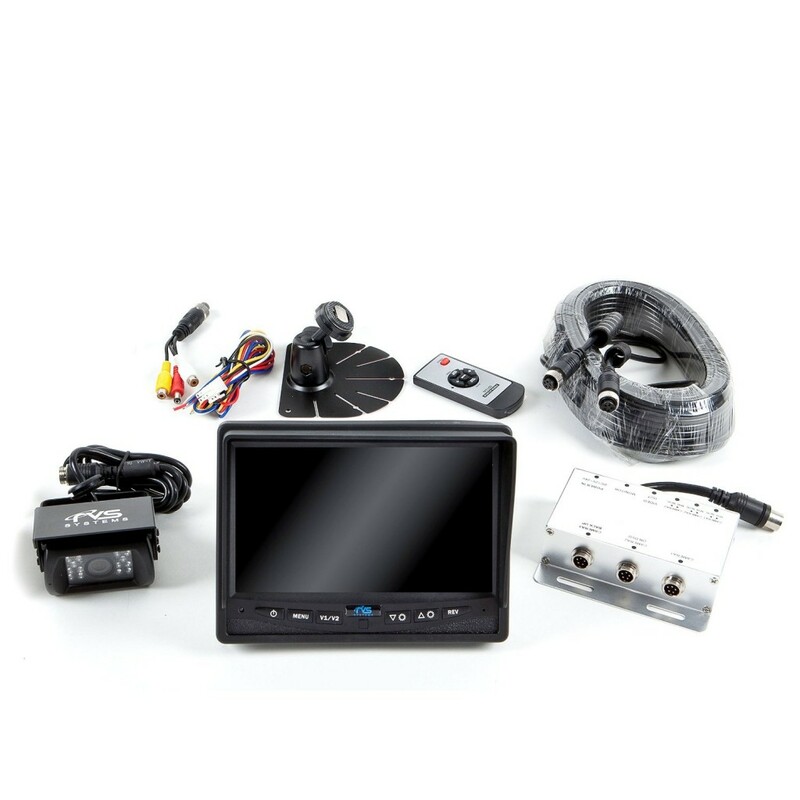 This system comes with multiple ports for cameras and even a DVD player, and you will appreciate how easy it is to install on the back of your truck or RV. A consistently high-rated model in this specific product category, this backup camera offers a completely waterproof capability with its impressive IP69K rating, so it can work fine in all weather situations. The onboard three-channel multiplexer enables the system to accommodate a maximum of three cameras at a time, enabling you to supplement the system with two additional cameras. The camera features 18 infrared lights that allow you to see up to 50 feet even when the surroundings are completely dark, and with a night vision that requires no ambient light at all to do its job. The camera monitor displays distance grid lines that provide a reference for the backup camera so you can safely move your vehicle knowing how much room there still is behind your RV. The camera view can be controlled using the multiplexer for a choice between a normal image and a mirror image to enable the connected cameras to serve as forward-facing or backup cameras. According to one customer, the provided manual does not have information for setting up the system after its installation. Often considered the best backup camera for a RV, this system will actually make it easy to maneuver you large vehicle safely into a parking space. The sleek design of the rearview camera from Atian makes it a popular choice with consumers who are looking for a discrete system to install on their recreational vehicle. The 2.4GHz camera is also designed to be easy to attach to the back, and since it is wireless all you need to do is plug it into a 12V or 24V connection. With its 4.3-inch Color TFT LCD Car Rearview Monitor, this model provides two video inputs that enable it to work with car rearview cameras. This model provides functional support to car DVD and surveillance cameras, satellite receivers, STB, and other video equipment. It offers parking rearview priority, with the monitor starting up automatically and displaying the video obtained through the rearview camera synchronously when you are backing the car. The monitor switches itself off after backing has been completed. The monitor provides high-resolution images and even features a full-color LED backlight display so you can obtain crisp, sharp pictures that can be viewed even in the dark interior of your vehicle. The scenes cut automatically to the rearview camera during the backing process and then changes back to the original scenes afterward. Based on the experience of one buyer, the supplied bracket only works for vertical mounting since it is too shallow to suit horizontal mounting. If you are looking for the best wireless backup camera, the Veise SP766M2 might be just what you need for your RV, truck, bus, or almost any other large vehicle. 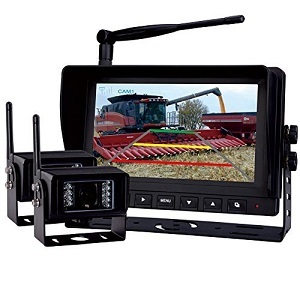 Since it comes with two backup cameras with an IP69K rating you can even use this rearview camera system with cranes, excavators and other types of heavy equipment. The durable housing ensures that the cameras are water and weatherproof, and it also prevents dust and other debris from getting inside. This system is also vibration and shock resistant, so you can drive over rough ground without worrying about damaging the cameras. The two cameras are connected to a 7 inch color monitor that will clearly display the transmitted images, and you can even split the screen in two. This allows you to view images from both cameras at the same time, so you can confidently backup and park large vehicles without any problems. 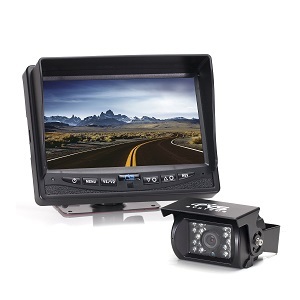 This Rear View Backup Camera System comprises all you need for an efficient functionality from this kind of device, as it comes with a 7-inch wireless LCD monitor, a digital, wireless, waterproof, color camera, the needed wires for power, and the necessary accessories for setup and installation. This model is suitable for use as a reverse camera, a cab video observation system, and a compact CCTV security kit for motorhomes, RVs, trailers, forklifts, and agriculture. 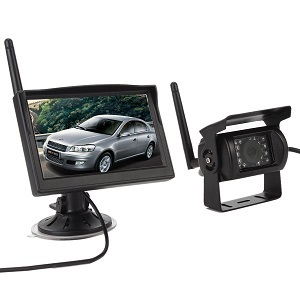 The 7-inch digital, wireless LCD monitor is equipped with a full/split screen capability to provide the details you need from images obtained by the digital color camera with night vision. The removable sun visor on the digital TFT LCD monitor enables the easy viewing of images under the bright sun so you won’t miss a thing. The video is not high-definition and can be choppy at times, according to one customer who is still satisfied that the unit does the job adequately.